This really is a strange phenomenon as there is plenty of evidence from other upland areas of England and Wales of Roman occupation. What evidence there is has tended to come from the northern, eastern and western fringes of the moor. There were two Roman forts on the very northern fringes, one at North Tawton and the other at Okehampton and it is suggested that these stood on or near to roads that would have led to Exeter. It has also been suggested that there was a signal-tower platform at Sourton and a fortlets at Ide and once again Okehampton. If you trawl through the ADS records there are various coin findspots at Black Tor, Princetown and fairly recently at Hunters Tor. In 1897 hoard of some 170 coins were discovered on East Hill which lies above Okehampton. The Torquay Times carried the following report on the finds; “A very interesting discovery of Roman coins at Okehampton links the ancient borough yet more closely with its past. About three weeks ago, one of the road contractors (Mr. F. Furse) was at work on the Okehampton Park a little distance above the railway station, when about three feet under the ground he discovered a hoard of Roman coins, to the number of one hundred and thirty. He took them to Dr. E. H. Young who is greatly interested in antiquarian research and that gentleman communicated with the Rev. S. Baring Gould, who, as secretary of the Dartmoor Exploration Society, was keenly interested. The Rev. 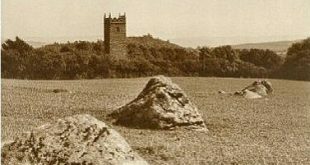 gentleman went to Okehampton, and, together with Dr. Young, visited the spot where the discovery was made, and after a most exhaustive search succeeded in unearthing forty additional coins, making a total of one hundred and seventy. The coins are of the third brass series, and are nearly all of the reign of Constantine – early in the fourth century. Considering that the coins were loose they are in a very good state of preservation. All of the coins are of the usual type, their intrinsic value is not high. It being treasure trove, the Rev. S. Baring Gould, who is taking charge of the coins, has communicated with the Treasury authorities asking permission to place the coins in the Dartmoor section of the Plymouth museum.” – The Torquay Times, October 22nd, 1897. Strangely enough the Gentleman’s Magazine of 1862 mentions a pot full of Roman coins being discovered in a field called ‘firestone’ which lay opposite Addiscot farm. These were said to have dated from the time of reign of Severus which would date them to no earlier than AD193. Although not on Dartmoor in 2007 some significant Roman finds consisting of coins were made at Ipplepen which is located some seven miles from the National Park. In 2011/2012 a team of archaeologists carried out both a geophysical survey and trial excavations which strongly suggested a Romano British site of several acres. Amongst the finds were; “a Roman road, a square enclosure ditch of Roman date, and an Iron Age/ Romano-British round house. Many fragments of pottery were recovered including imported wares such as amphora from Spain, and decorated Samian ware. More coins were found, along with a fragment of human bone, dating to the Roman period.” – The Ipplepen Archaeological Project (online source). Further archaeological work has been carried out since 2011 during which a great deal more of information has been gleaned. In simple terms this site has re-written the historical theory that there was very little Roman influence outside of Exeter. For more information on the project visit the Ipplepen Archaeological Project’s website – HERE. There are basically four documentary sources which possible indicate Roman place-names on Dartmoor; the Geography of Ptolemy, the Antonine Itinerary, the Peutinger Table and the Ravenna Table. From these Todd (1987, pp. 202 – 204) suggests that possibly the name of the river Dart derived from Derventio which is found in Ptolemy’s Geography. The Ravenna Table also records an indirect link from Tabo to Tavus which is the river Taw. The fort at North Tawton has been identified as Nemeto(s)tatio this once again appears in the Geography of Ptolemy. There are a few more recent moorland place-names with the ‘Roman’ element such as; the ‘Roman Altar’, ‘Roman Bridge’, the ‘Roman Camp’, the ‘Roman Chair’ and the ‘Roman Cross‘. There are also several tales of the Romans that have set themselves in the folklore record. Firstly it was always said that Julius Caesar visited Lydford which I suppose is a nice a place as any to drop into. There are stories of ghostly legions marching up and down Hunters Tor, there was also supposed to have been a Roman camp near Wotter Brook Head. In Chaw Gully there is a mine shaft that is said to hold vast hoards of treasure and this is known as the ‘Roman Mine‘. Oddly enough the ‘Roman Chair’ is an outcrop that had been fashioned to look like a stone chair. There is a nearby Iron Age hillfort that traditions claims was once a Roman Fort, hence the name of the stone. Now here’s the rub it is located on the same East Hill as where the hoard of Roman coins was discovered – no smoke without fire or what? So there it is, if this page was about anywhere else there would be enough Roman content to fill a separate website but sadly at the moment Dartmoor can’t do it – Vini Vidi but couldn’t Vici. Fox, A. 1973 South West England – 3,500 BC – AD 600, David & Charles, Newton Abbot. Kain, R. & Ravenhill, W. (eds) 2000 The Historical Atlas, Exeter University Press, Exeter. Todd, M. 1987 The South-West to AD1000, Longman, London.